Rev. Billy is in town and since I’m running for Mayor we decided to talk a little. Wanna come? We are going to talk a little about art, activism, affecting culture and politics and see what makes this guy tick. Talk show style. I think it’ll be fun. Rev. Billy just premiered his movie at the Roxy just in time for Christmas… he’s here staying at my house anyway, mine as well make him sing for his supper. Between my running for/from Mayor and him trying to ruin Christmas for everyone it might just be an interesting conversation. His wife, Savitri D will also be there. I think she is generally smarter and better looking then him. With less hair products. My house is 3359 Army Street @ Mission. We can only seat like 100 people. 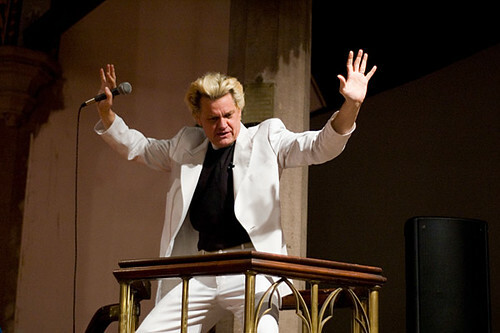 UPDATE: Steve Rhodes has some photos of the Reverend Billy & Chicken John talk.